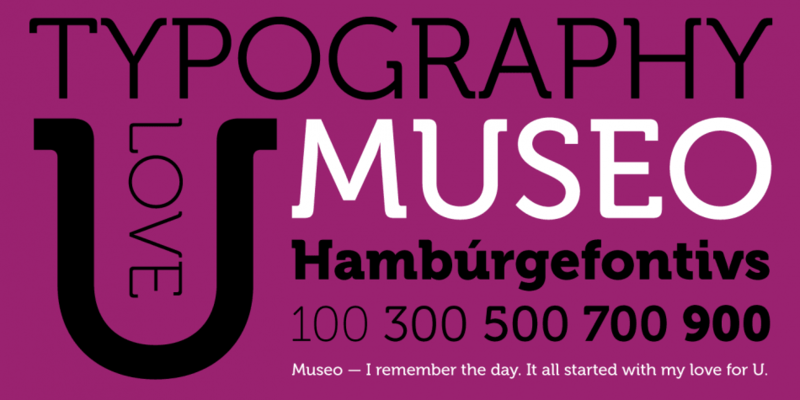 Museo is a sans serif and slab serif font family. This typeface has ten styles and was published by exljbris Font Foundry. A ten font family. This contains every font in the Museo Family. Museo… it all started with my love for the letter ‘U’. This uppercase letter just came to me as an image in a daydream. The top of both stems bent into semi-slab serifs. From this principle I worked out the rest of the uppercase letters. My first intention was to make it an all-caps display font, but after a while, I changed my mind. I wanted it to be a bit more versatile, so I decided to add lowercase and adjust spacing and kerning to increase legibility.